Oriental themes are always popular in garden design and make excellent styles for a modern, low-maintenance approach to gardening, in larger yards, but especially if you have a small garden, courtyard or even just a deck or terrace to work with. Imagine coming home from a stress-filled, busy day and stepping into a tranquil retreat of calm, green light and shade – a place where you can unwind, relax, even meditate and re-charge your inner batteries before returning to your life. Creating such a space is actually simple and one of the easiest garden projects you can undertake. You don’t need a lot of materials or plants to get that air of calmness and relaxation going, where the permanence of nature will bring balance to your life and sooth your body, mind and soul. Just a few simple elements, stone and the right plants, can give you all that, and we can help you make the right choices to bring it all together. 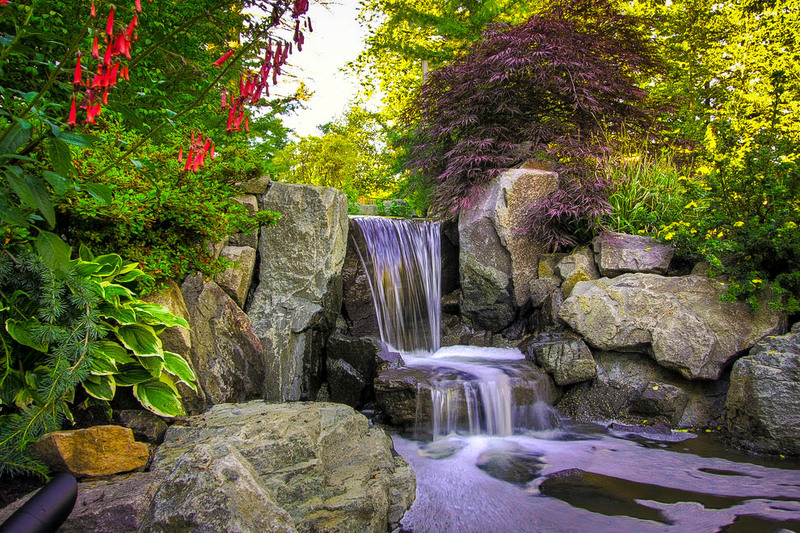 In fact there are a number of different styles of Japanese Gardens, but for most of us, the most instantly recognizable is one built around gravel, attractive stones and simple plantings. So what elements do you need to give your garden that Zen flavor? 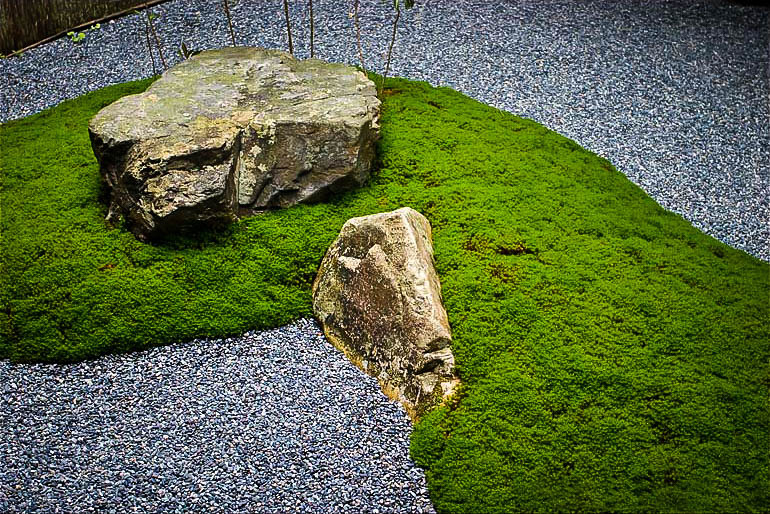 In Japan, moss is a popular surface for the ground, but Japan has a lot of rainfall in summer and for most people in the US, dry summers make moss-gardens an unrealistic option. Second choice would be gravel or very coarse sand, something around the size of a pea or a bean is usually perfect. This can be laid a couple of inches deep over some landscape fabric, to keep it from filling with soil and to stop weeds growing. Finer gravels and sand can be raked into those patterns often seen in pictures, if you have the time to spend and can make a coarse rake out of a flat piece of wood with notches cut in it. For the rest of us, a smooth surface is fine. The second important element is a few nice, large rocks, natural and interesting in shape. Perhaps you can find some in nearby woods and bring them home, or some garden centers and suppliers sell them. Nice and big and just a few is all you need. The Japanese gardeners always work in odd numbers, except for two. So one, two, three, five or seven stones, depending on the size of your area, is all you need. If they look a bit raw, spray them with some milk a few times and this will encourage mosses and lichens to grow on them. Place your rocks around the area in an interesting arrangement – look at some pictures on-line to get the idea. If your budget can stretch to a stone lantern that will instantly give the perfect look, but it is not an absolute necessity. A large Chinese pot will also set the theme or any other item with an Eastern flavor will work well too. Some inexpensive split-bamboo fencing can easily be attached to an existing wall or fence and will immediately set the right tone for a background. There are a number of traditional plants used in Japan, some are suitable for American gardens and some are not. The key thing is not to use too many plants – space is important so each plant is seen more or less alone. 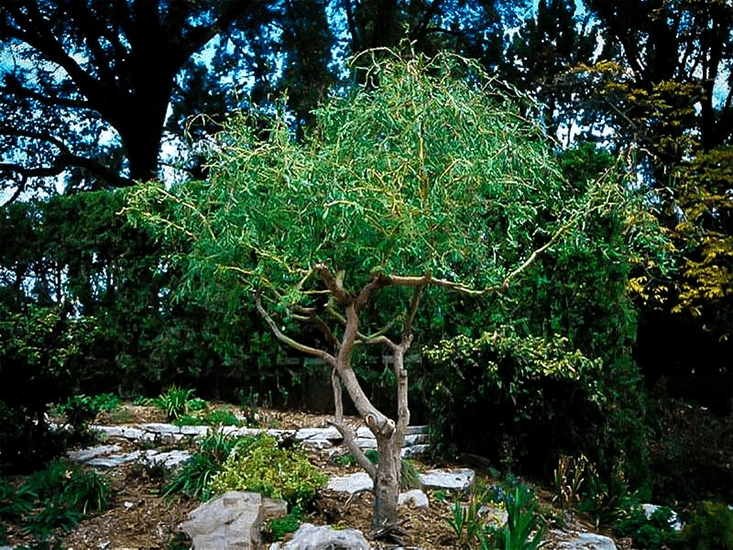 This is the quintessential tree for an eastern garden and a wide range is available. 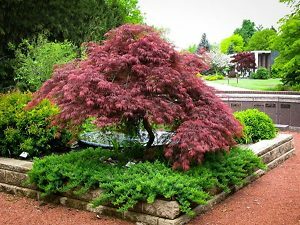 These have already been the subject of an earlier blog – The World of Japanese Maples – and that will tell you everything you need to know to make the perfect choice. Put simply, the main choices are between red or green leaves and between weeping or upright habits. In a shady garden green foliage will show better – in sun red leaves will not only look stunning but be brighter-colored too. Weeping forms are perfect for a sloping area, or planted in a large pot so that they can cascade down. The Green Cascade Japanese Maple is especially lovely and for an upright, red-leaved tree, the Sherwood Flame Japanese Maple is a knockout. In Japan the pine tree is a natural companion to the maple, giving all-year-round effect and stability, while the maple goes through its season changes. 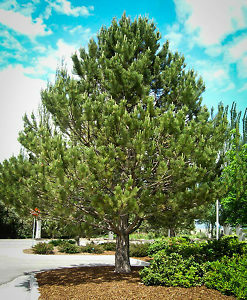 In a larger space, the Austrian Black Pine has just the right look and can be pruned to keep the open branches seen in Japan. For a smaller garden, or as a feature plant, nothing can beat the White Weeping Pine, with its cascading branches giving just the right effect. Another great choice is the Dwarf Serbian Pine, which fits into the smallest garden, or perhaps you could group three near the base of a boulder for a stunning effect. This is the third element in traditional Japanese plant choices, with its upright, grassy leaves and attractive stems it has perfect appeal. For a smaller space the Sunset Glow Bamboo stays neat and compact, while for spectacular stems the Black Bamboo or Golden Bamboo have tall stems of those colors. The Multiplex Bamboo will bring a calming jade-green to your garden and its tall, arching stems will rustle in the breezes and play tranquil mood-music while you enjoy your garden. 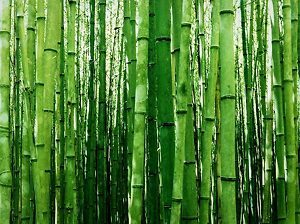 Plant bamboo either as a single clump, or use it as a backdrop screen to hide an ugly fence or give privacy to your garden of meditation. These flowering plants are also widely grown in Japan. Amazingly, in Japan the flowers are often clipped-off while still in the bud to maintain the soft rounded form of the plants. 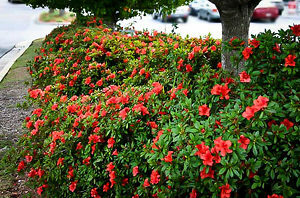 Most of us won’t want to do that, and indeed, having flowers twice a year sounds like a great plan and one you can achieve with the Encore Azaleas. To keep the calm atmosphere, opt for the white purity of the Autumn Angel Encore Azalea or for color, try the Autumn Lilac Encore Azalea for a calming but rich color effect. Rhododendrons too can be used to good effect, especially more compact ones like the April Rose Rhododendron, the Lemon Dream Rhododendron or if you live in a colder area, the Hellikki Red Rhododendron. There are other, less traditional plants that work well too, including English Boxwood, which can be planted in a group and then clipped into undulating shapes the Japanese call ‘wave-form’. In a shady garden instead of pine, try a Canadian Hemlock, which can be thinned out to give it a mature appearance even when quite young. If you have wet soil a Corkscrew Willow really brings the right feel and can also be grown in a pot, where its amazing twisted branches will hang down and create just the right atmosphere. The Cascade Falls Bald Cypress is another plant with pendulous branches that imparts an exotic feel and Bruns Weeping Serbian Spruce is very ‘un-spruce’ in its twisted form, not like its erect and formal cousins. A Purple Wisteria will cover a fence and can even be grown into a free-standing tree with some early staking and patient pruning. The flowers give a very oriental feel to your landscape and the arching branches soon become exotic and ancient-looking. 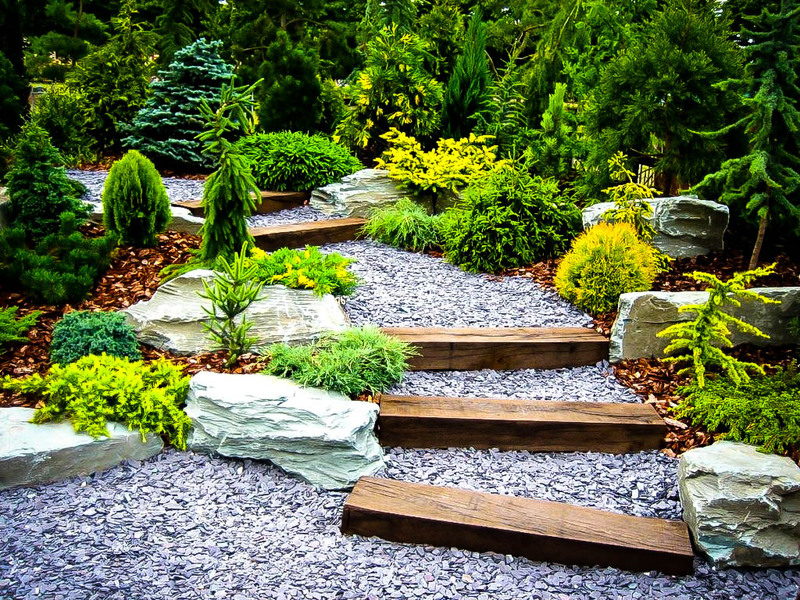 So with a few carefully-selected plants, some stones, gravel and perhaps an oriental accessory or two, it’s easy to bring an eastern charm and style to any area of your garden, whatever its size, location or neighborhood. The key is to choose plants suitable for your zone and soil and place them effectively to give the atmosphere you are looking for. What?! This is socially and morally unacceptable and, in most countries, would be considered theft. You either get rocks from friends who have them or you buy them. Never, never think of taking them from the wild. Fair point. I was actually thinking about some wooded areas that might be on your own property, but no, I am not endorsing the theft of rocks from someone else’s property, including of course federal and state land. Absolutely not. Mind you, how many of those rocks that are sold come from legitimate quarries, and how many are just picked up by an enterprising person with a truck? Pity they don’t come with provenance stamps! I never thought the writer suggested picking up rocks from privately owned land by others or public land, that is, government owned. It would be rather difficult to carry to a vehicle boulders or even simply large rocks. In my case, we have 3 landscaped acres and 2 acres that are woodland. Thus we are able to find some substantial rocks in our property. For larger hardscape projects we purchase rocks, boulders and gravel from either a quarry or a local local business that specializes in hardscape materials.